Moringa has become popular as a superfood overtaking the likes of spirulina and chlorella for its sheer density of nutrients. It is one of the most nutrient-dense foods on the planet. It provides natural vitamins, minerals and protein. Enough to supplement a balanced diet. Moringa also contains iron, B vitamins, vitamin D, zinc and magnesium. It is also a great source of protein, rich in amino acids such as threonine, isoleucine, leucine, phenylalanine, valine, methionine, cystine, tryptophan, lysine and more. The leaves are abundant in phytonutrients such as quercetin and kaempferol, two very powerful bioflavonoids. Our Organic Moringa supplement provides high quality moringa leaf. We've added nothing to this natural blend, so that all you get is pure organic moringa in every vegetable cellulose capsule. The use of a vegetable cellulose capsule for the supplement enables us to avoid the addition of unnecessary chemicals, excipients, binders and coatings that are commonly found in tablet supplements. A vegetable cellulose capsule is designed specifically to break down naturally within the acid of your stomach, ensuring that your body absorbs the nutrients during digestion. 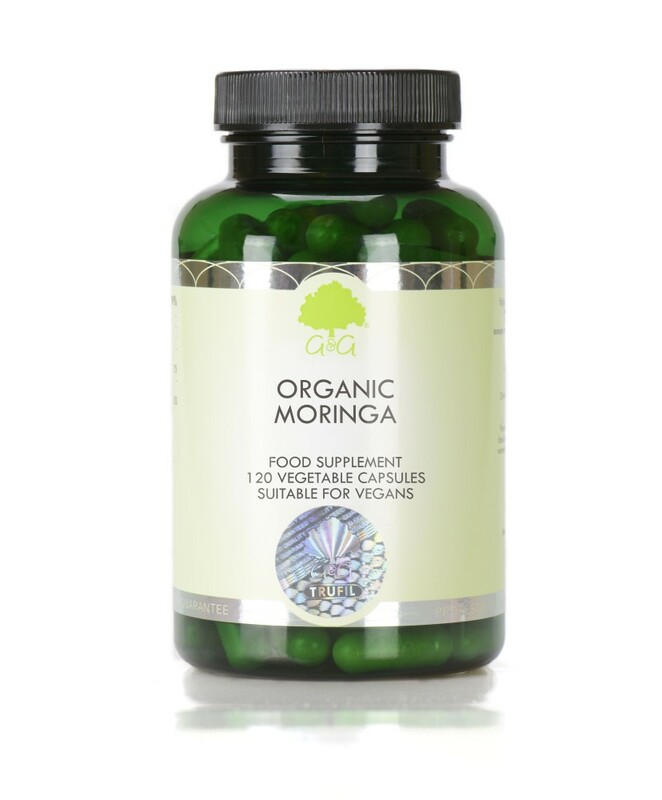 Our Organic Moringa supplement is suitable for vegans and vegetarians. It is also certified organic and approved kosher. Take 1-2 capsules daily, or as directed by a professional. Do not exceed stated recommended does. A food supplement should not be used as a substitute for a varied diet or health lifestyle. I have received my moringa vitamins and I’ve commenced taking them. They smell strong in the instance. But I feel that if they are going to improve my health then I don’t mind taking. They do say anything that have a strong smell is good for you.